I was exhausted this morning and didn’t make it to the beach, much to the disappointment of deep spaniel eyes – we’ll go tomorrow, I promise. This made me realise that I needed to relax today and I decided to make a cake ,as I find baking very calming. The other day, we had been looking through a recipe book we bought probably 30 years ago – one of four – which we had dipped into for some reason. It’s called A Glut of Citrus Fruit by Ann Carr. 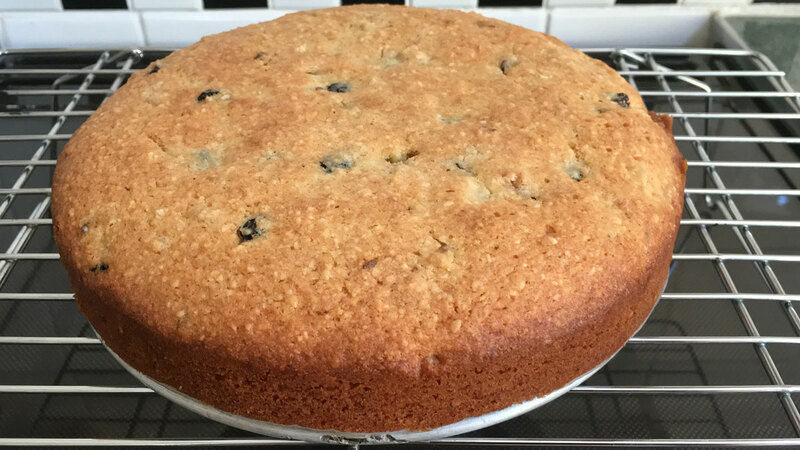 I saw a recipe there for Lemon and Currant Cake, which I liked the look of. I prefer sponges and light fruitcakes to rich cream or chocolate cakes, so this sounded delicious to me. Now, at the moment, I’m taking part in the Ultimate Blog Challenge to reinvigorate my blogging and have committed to posting something every day for 31 days. It was suggested that today we post about our social media accounts and I wanted to do this, but also wanted to write about my cake, so I thought I would combine the two. After all, what better than to connect over cake? But then I thought, we can’t actually share this cake online, so the next best thing is to share the recipe. I rinse the currants and candied peel in hot water to rinse off excess sugar of my own accord as I think it keeps the cake lighter, but is not essential. Beat the butter and sugar together, then add the eggs separately and beat. Stir in the lemon peel, candied peel, currant and almonds. Then fold in the flour. Pour the mixture into a greased 8-inch tin and bake at 180°C (350°F/Gas Mark 4) for 30-40 minutes or until an inserted knife or skewer comes out clean. I hope you enjoy the cake, if you decide to bake it, and hope the photo and video don’t make you too hungry. I post my kitchen adventures on my social media accounts, as well as photos and videos of adventures with our dog, walking in the countryside, views of Ilfracombe where we live in North Devon, business information and comedy. I enjoy discussions, but not hard sell, so while I’m happy to see everyone promote their businesses, I don’t like being sold to. I think that building relationships is what is important. Sometimes these will be social, sometimes they will be about business and occasionally they will combine the two. I don’t like to cook but thank you for posting the recipe. Thank you for the recipe! I am definitely going to try it out! I have also connected with you on your social media sites. Many thanks, Gwen. I have connected with you, although Twitter is suddenly restricting my connections so will wait until I can connect there. This was such a clever way to promote your social media accounts! It’s too hot to bake today, but I have pinned this for later. I’ve followed you on Twitter and Instagram. Sooooo, how did it taste?? I don’t have an oven here in Belize so I don’t do any baking however, I am doing some drooling right now as it looks delicious! It was scrummy. Sending you a virtual slice. Sounds delicious! Baking is also a stress reliever for me. I enjoy creating delicious treats that everyone can enjoy. Thanks for sharing! I find it one of the best ways of relaxing in addition to walking. Your cake looks delicious! I already had my blog plans but didn’t think of putting them together with the share links! I connected to all yours, maybe you can click mine when you see me on yours! Thanks for the recipe. Thank you, Martha. I will follow back, although am sorting out Twitter as I have hit a follower limit. I collect vintage cookbooks and enjoy cooking from them! I love that you find baking relaxing – it is the opposite for me. I think I find it relaxing because I am doing something with my hands.